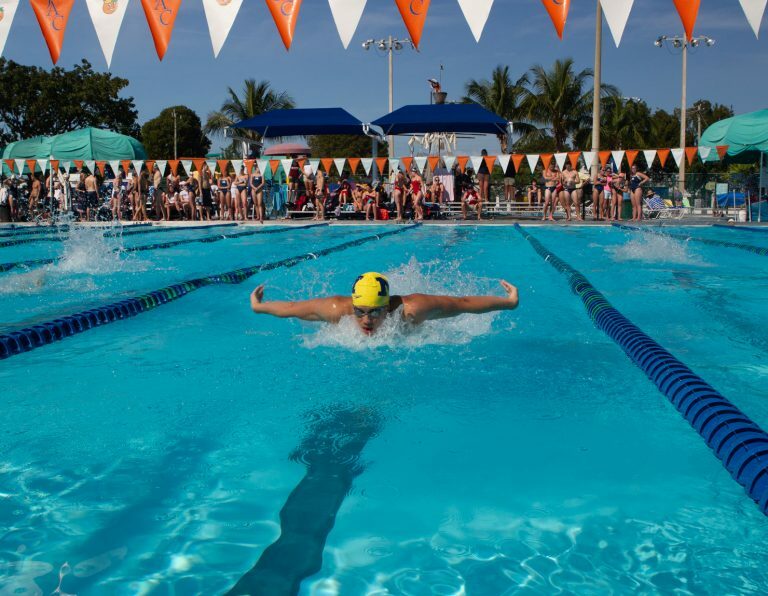 Come join the excitement at the Annual Orange Bowl Winter Training and Orange Bowl Swim Classic at Jacobs Aquatic Center in the fabulous Florida Keys. The Orange Bowl Swim Classic is an official Orange Bowl event, held annually January 3rd, and is an integral part of the month long Orange Bowl festivities, highlighted by the nationally televised Orange Bowl Football Classic. JAC features a 25m, 8-lane Myrtha pool with 9-foot lanes, non-turbulent lane lines, and dive well. A state of the art LED Scoreboard and Colorado timing system ensures accurate times and an attractive graphic display for swim meets. JAC also has a dry land facility for dive training, a 28 x 42 multi-use pool and a 1200-square-foot room with video equipment to facilitate training seminars or meetings. Completed in June, 2002, JAC has earned a reputation as a first-class facility with terrific staff support. JAC invites select college swim programs to be a part of the internationally acclaimed Orange Bowl festival by participating in the Orange Bowl Swim Classic and Orange Bowl Winter Training. Not only will the swimmers flourish in a supportive tropical swim infrastructure where 80-degree air temperatures are the norm, but they will enjoy the other unique touristic features of Key Largo and the Florida Keys. This is the home of the Florida Keys National Marine Sanctuary, and the entire community is marine-oriented. College swimmers often go out on snorkel trips to the coral reef. Learn more about Key Largo, Florida. For more information call 305-453-SWIM.